Sent to Green Living Ottawa by Frances Ann Smeaton. Ali Howard, originally from Ottawa, swam the Skeena river from the Sacred Headwaters all the way to the Pacific Ocean (610 km) to raise awareness about the potential impacts to this special area by Shell. 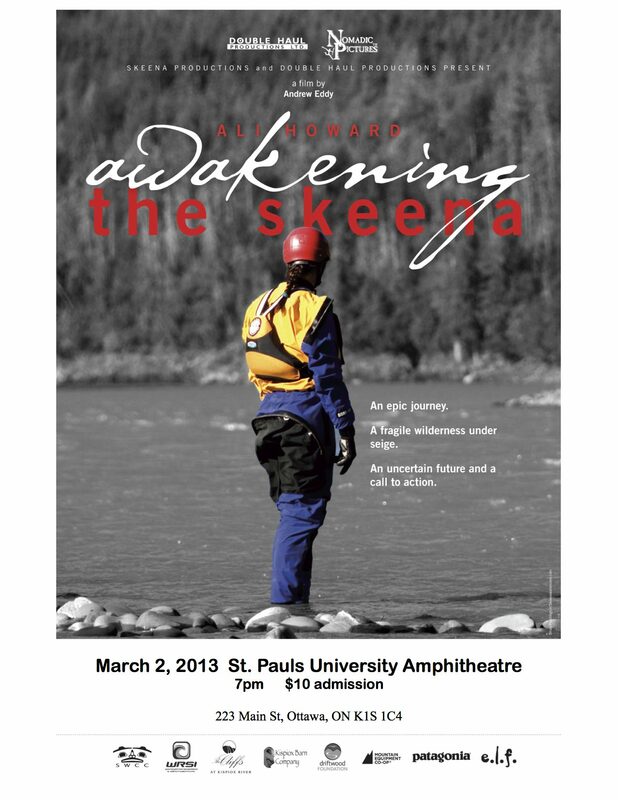 A film of her journey will be shown at St. Paul’s University Amphitheatre on Main Street in Ottawa at 7:00pm on Saturday, March 2nd. Ali will be present to talk about her experience and answer questions. Ali is a passionate, energetic person cares deeply about our planet and our country. The Sacred Headwaters is the birthplace of the Skeena, Nass and Stikine Rivers. These three rivers are among British Columbia’s greatest salmon rivers. The Skeena is the second longest river in British Columbia. In 2004, Shell Canada (now Royal Dutch Shell) was awarded a 400,000 hectare tenure to develop coalbed methane (CBM) in the Sacred Headwaters in northwest British Columbia. This movie documents Ali’s swim raise awareness and help protecting this pristine region.